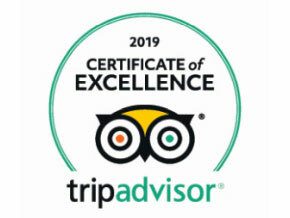 Professional Krakow guide invite You for a guided tour to the little homeland of John Paul II. During the sightseeing we will visit Wadowice, a small, picturesque town, where the future Pope was born and a wonderful, 17th-century Sanctuary in Kalwaria Zebrzydowska, the place, which strongly influenced the religiosity of the young Karol Wojtyła. Our pilgrimage begins in Kalwaria (meaning ‘the Calvary’) Mannerist buildings of the Sanctuary has such an exceptional value, that they were put on the UNESCO World Heritage List and declared a historical monument by the Polish authorities. Mikołaj Zebrzydowski, founder of the complex – who was a magnate and major political player, but also a very pious man – initiated the construction of Calvary in the early 17th century. The main inspiration was the work of Dutch theologian called Adrichomius, who described the Holy Land (the way it looked in the time of Christ). Apart from the magnificent Basilica and Bernardine Monastery, many beautiful chapels dedicated to the different stages of the Passion and events from the life of Vrgin Mary were built there. It was the first foundation of that kind in Poland! Nowadays, the chapels – each one of them is a real gem of architecture – are hidden in a greenery and connected by the paths hiking through the hills (called Golgotha, Mount Zion, Mount of the Olives).The beauty of this complex and its perfect fitting into the landscape is breath-taking! After the Kalwaria Zebrzydowska sightseeing we will go straight to Wadowice. In the hometown of St. John Paul II we will visit the house, where he spent his childhood – today it is a fascinating museum. We will also visit the Basilica of the Presentation of the Blessed Virgin Mary and take a walk through the Market Square to the patisserie, where the young Karol and his friends ate the famous cream cakes. Our tour Kalwaria Zebrzydowska, Wadowice sightseeing is a great supplement to the route Paths of John Paul II, which include all places related to the Pope in Krakow. The ticket must be booked online; of course, we could do it for You! The main designer of the church and monastery was Giovanni Maria Bernardoni, an excellent architect and a Jesuit priest. Flemish goldsmith and architect Paul Baudarth was another important figure during the construction. We will also see the Chapel of the miraculous image of Our Lady of Kalwaria venerated since the 17th century. It is noteworthy that the Sancuary is also famous for the great mysteries of the Passion re-enacted every year during the Holy Week. They attract thousands of pilgrims. The paths and chapels referring to the buildings of Jerusalem occupy a total area of 6 km2! They are divided into two parts – the first one with the stations of the Cross is devoted to Lord Jesus and the second one present the suffering of the Virgin Mary, her joy of the Resurrection, the Dormition and Assumption. Paul Baudarth, designer of the chapels used not only his architectural knowledge, but also his experience of a goldsmith – thanks to that each one of the buildings looks like a jewel in a beautiful setting. Chapels are located in the charming, hilly terrain, creating a very picturesque landscape conducive to spiritual contemplation. The house, in which Karol Wojtyła spend his childhood and early youth, is located in the heart of Wadowice, next to the main church of the city. An extremely interesting exhibition is divided into several parts. The first one entitled ‘Little Homeland’ is a presentation of Wadowice in the time of the future Pope’s youth (the place and the people, who were creating it). Many of Karol’s colleagues were Jews, so the separate room is dedicated to the memory of Wadowice Jewish community. Visiting the exact apartment of the Wojtyła Family is an incredibly touching experience. The museum also presents some objects associated with Krakow period of Pope’s live and with his pontificate. Wadowice Basilica has a long history. The chancel of the church dates back to the 15th century and the naves were rebuilt after a fire in the late 18th century. Its facade and distinctive tower with a clock and specific “bulbous” cupola dominates over the charming Market Square. It is difficult to stop thinking about great significance of this church in Pope’s life, what makes visiting a highly emotive experience. Nowadays, it is also one of the places of his cult. The relics of St. John Paul II are guarded by men dressed as Swiss Guards. Finishing Wadowice Basilica sightseeing we take a look at the monument of Karol Wojtyła standing in front of the facade. 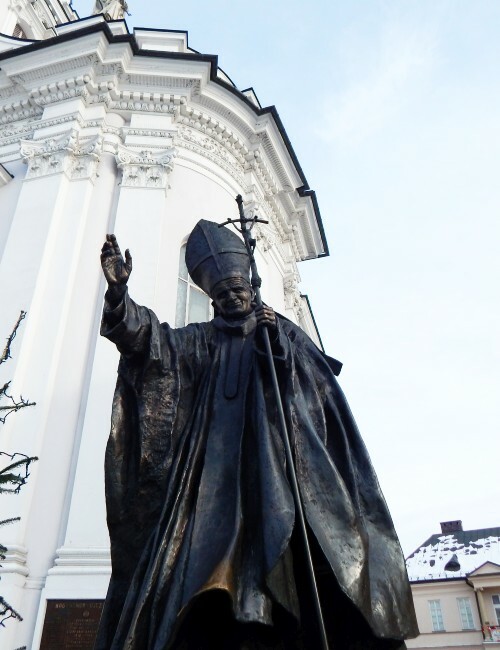 During his pontificate, John Paul visited his beloved Wadowice three times. In 1999, speaking to the residents and pilgrims gathered on the Market Square, the Pope recalled his youth in a very touching way. He talked about his friends, teachers, favourite places. Walking through the market, we literally follow in his footsteps. Finally, at the end of this lovely, sentimental journey, we will get to the house number 15, where was once a patisserie of Karol Hugenhuber, the local, in which the future pope and his school friends were enjoying the taste of famous Wadowice cream cakes.